Recently I got tired of my breakfast routine, which I had for at least 6 months, if not a year. I actually can’t remember when I last had something else for breakfast than fresh fruit with yogurt and granola. Time for change has come, and I had to look out for an alternative. While I bake muffins and breakfast cakes at least twice a week, I don’t like them for breakfast. I need something not too solid that can to be eaten with a spoon. For the first time ever, I used and tasted soy milk. This porridge is surely a good place to use it. Cooking the buckwheat in soy milk gives it a lovely creaminess. 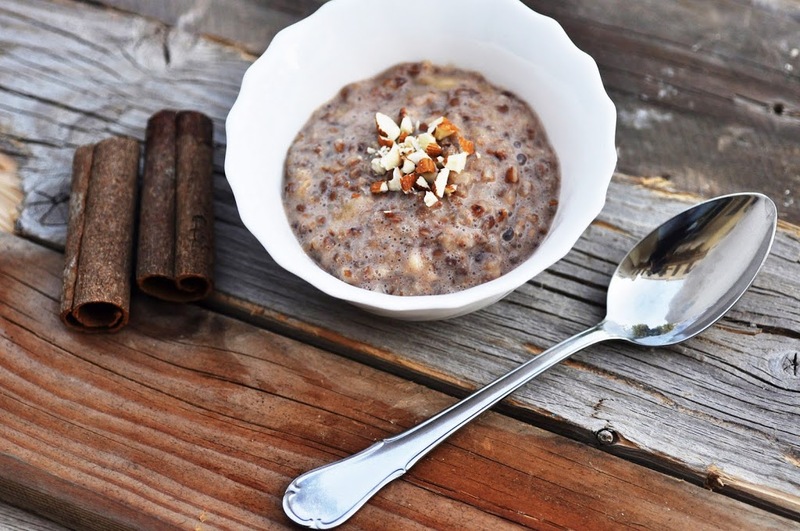 Adding a pinch of cinnamon adds to the warmy winter feeling that this breakfast provides. It’s sweetened with raw mashed banana only. The chopped nuts add some crunch. On the whole, a filling breakfast, yet light on the stomach. A good meal if you have a long day ahead and surely a good thing to eat before long runs.